Please allow up to 48 hours to process your order. 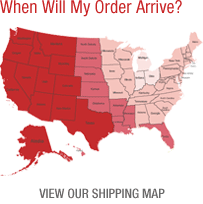 All orders to the continental USA include UPS Ground shipping at no charge. Shipping to Alaska, Hawaii and Canada is extra. For International orders, please contact us at [email protected] for a shipping quote. 1- The Invoice Number, if you have it. Upon arrival of your package, we will inspect the goods. If all appears kosher, we will credit you the full amount of your product cost. If you need additional info, contact us at 866-487-9265.